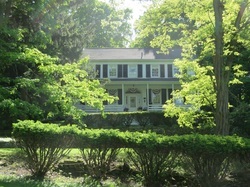 On Tussey mountainside above Boalsburg is the home referred to as Hill House because of its location. This fine stone building was erected in 1830 by Col. James Johnston, builder of the Boalsburg Tavern. The fanlight door and handblown glass window panes, details of woodwork, fireplaces and the staircase are among the features of this old home. It was here Madame Boal lived during a long convalescence. The house been owned by remembered Boalsburg people among them: Col. Boal, the Michael Segner Family, Ray H. Smith, Dr. John Light, and Hays Gamble.